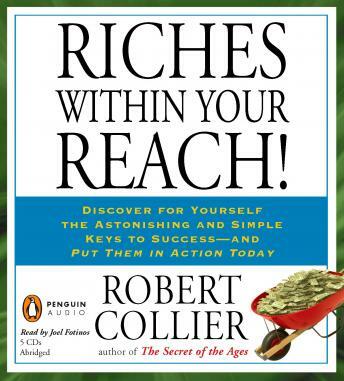 Trusted and beloved by readers everywhere for his prosperity classic The Secret of the Ages, Robert Collier takes the next step in Riches Within Your Reach! and explains how to harness mental visualization to achieve financial and professional success. 'A definite purpose, held on to in the face of every discouragement and failure, in spite of all obstacles and opposition, will win no matter what the odds,' wrote Robert Collier. And with faith in your own definite purpose, taught the self-help master, there is no limit to what you can accomplish. In every adversity, there lies the seed of an equivalent advantage, and in each defeat, there is a lesson in how to achieve victory next time. This is the message of Riches Within Your Reach! In 1947, Collier produced Riches Within Your Reach! to assemble his most talked-about works into one simple guide. It features: The God in You (1937); The Magic Word (1940); The Secret of Power (1945); and The Law of Higher Potential (1947). Together, these pioneering works reveal all facets of one powerful secret: Human beings, since the dawn of history, have used the applied principles of mental visualization to achieve their aims. Many of the world's most successful figures -from Napoleon Bonaparte to Benjamin Franklin to Andrew Carnegie-began their lives at a significant disadvantage, without the wealth or health that many of their peers enjoyed. Yet they were able to triumph and succeed in ways that their contemporaries weren't-by tapping into the infinite power of their own minds. Riches Within Your Reach! not only builds upon this teaching but illuminates Collier's most remarkable lesson ever: that each of us has an equal chance to harness the powers within ourselves to succeed, but first, we must learn how to focus our desires.